value | Hackney Fit: Get Fit, Feel Good! Hackney Fit: Get Fit, Feel Good! Take Control of Life: Get Fit, Feel Good – Now. It’s fitness time in Hackney. Get Hackney Fit now! Maybe you can’t find quite what you need in Stoke Newington, or you’re short of time in Clapton. Maybe by the time you get back to your home in Hackney Central or your flat in London Fields you don’t feel you’ve the energy for exercise and working out. So you’re going to wait until the time is right. But the time is never absolutely 100% right. You can always find a reason not to get around to it. Unless you break that pattern (which is pretty easy, because it simply starts with just an email or a phone call and a small slot in your diary) you could always find excuses not to get around to dipping your toe in the fitness well – with all the good things that come with that. Like being in charge of your own body; feeling a sense of accomplishment; feeling powered-up so you have more energy to get other things done; slipping on your sports gear and feeling like you are a fitness person. Because the best time to start something is always now. The time is now. It’s your time. Use it. Do it. Now. *Currently Hackney Fit personal training clients get sessions from me, PT Simon Cole and – at no extra cost – access to my running and HIIT classes at London Fields Fitness Studio. Plus, you get free access to classes by several of my colleagues there. Now *that* is value! This entry was posted in Fitness and tagged fitness, Hackney, HIIT, London Fields Fitness Studio, motivation, running, starting exercise, value on January 21, 2015 by Hackney Tours. 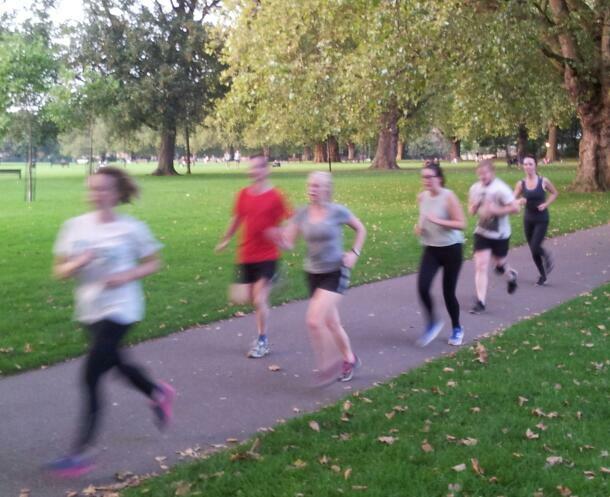 Outdoor training every Tue with #LondonFieldsBootCamp or personal training. You choose. The seasons are changing, but we’ve still got great weather to exercise in. We’re still training outdoors whenever it’s possible, including every Tuesday at #LondonFieldsBootCamp. That class is still only £5 for an hour and there’s no pre-booking. Just turn up at 6.30pm every Tuesday at London Fields Fitness Studio. This entry was posted in Uncategorized and tagged #LondonFieldsBootCamp, boot camp, exercise, Hackney, Hackney Fit, London Fields Fitness Studio, Spin, value on September 11, 2014 by Hackney Tours.